When checking out please put your four scent selections in the NOTE TO SELLER BOX. Orders are subject to scent availability but I do my best to make sure everything is in stock or poured fresh for your order. Scents with an * are unavailable. 8 oz jar, Burn time is approximately 36 hours. 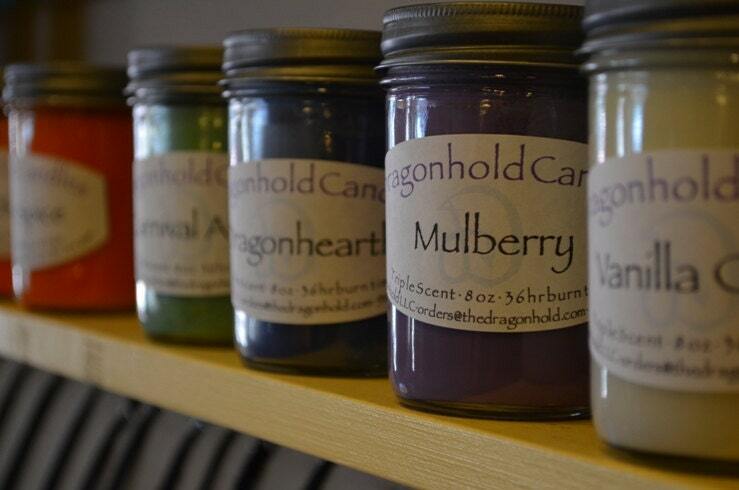 Our candles are all hand poured in small batches with Soy-Paraffin wax that is Paraben free and Triple Scented. We utilize zinc core wicks. Excellent throw is obtained with each candle. I sent these candles as a gift for Christmas. They were received broken; and even though the breakage was due to rough handling by UPS, the shop promptly replaced the broken candles. Great customer service! Amazing scent fills the house just great.i thought is was soy for clean burning but it does smoket black heavy smoke even with wick trimmed short. The quality and scent outweigh that issue. I would absolutely buy again. It has lasted a few weeks. The aroma is amazing. We take most forms of credit card through PayPal or credit card processing. We will be happy to cancel any order if the cancellation is received within 24 hours. The exception is any expedited shipping in which case we do not offer cancellation after the item has shipped. Taxes are applied for all North Carolina Sales. The tax rate is for Cumberland county as this is the location of our shop at 7%. These taxes are reported and remitted to the NC DOR quarterly as per tax regulations. We will take returns with a 10% restocking fee but the buyer is responsible for shipping the product back and a refund will only be issued once the item is inspected for damage. If the item is in the same condition it was shipped it, a refund will be issued (minus the 10%). Shipping is sent in the most cost effective way possible. Insurance is available on request for an extra charge. All items will be shipped within 5 days of receipt of order. Expedited shipping will only be undertaken if the customer pays the extra charges. Custom orders are available and the price will be set by the artisan as well as the delivery guidelines set by such artist. Due to traveling and festival schedule, some objects may have a 1-2 month ship date for custom orders.